The daughter of David and Peggy Rockefeller and a great-granddaughter of John D. Rockefeller, Eileen Rockefeller understood at an early age that her name was synonymous with American royalty. She learned in childhood that wealth and fame could open any door; but as the youngest of six children and one of twenty-two cousins in one of the world’s most famous families, she began to realize that they could not buy a sense of personal worth. Growing up with servants in lavish homes did little to compensate for the absence of parental attention resulting from continual cocktail and dinner parties, meetings, and foreign travel. Her mother’s dark depressions and mercurial moods, plus intense competition from her siblings, and the myriad feelings others harbored about her Rockefeller name adulation, judgment, envy, and endless curiosity contributed to Eileen’s sense of isolation and loneliness as well as to her drive for connection with others. In adulthood, she has become not an icon, but an accomplished woman and mother. Like all of us, she learned to find her own way. Through her intimate stories she shows us her philosophy: that power and richness come not from material goods, but from personal relationships and co-creation. This belief has strengthened her dedication to family and friends, and catalyzed her leadership in philanthropy and service. A pioneer in mind/body practices and social and emotional learning, and an active proponent of environmental sustainability, Eileen has forged a singular path even as she remains dedicated to her family’s legacy, finding her own balance and peace of mind. Being a Rockefeller, Becoming Myself is a universal affirmation of how identity is shaped and how we can contribute to the larger family of life, regardless of our origins. Eileen Rockefeller is the youngest daughter of David and Peggy Rockefeller, and a great-granddaughter of John D. Rockefeller. She is the founding chair of the Rockefeller Philanthropy Advisers and the Growald Family Fund. She lives in Vermont with her husband. "This beautifully written memoir is deeply moving. It inspires self-reflection and a passion for human connection. Being a Rockefeller, Becoming Myself models honest communication and the benefits of sharing feelings in constructive and loving ways. Readers will enjoy learning about the Rockefeller family, and more importantly learn valuable ways to relate compassionately to family members, friends, and themselves." 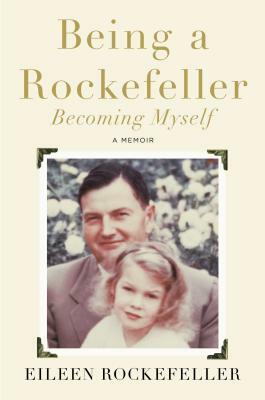 "In this poetic memoir, Being a Rockefeller, Becoming Myself, Eileen Rockefeller courageously shares what it was like to grow up the youngest child of six in one of America's most storied families. ‘Do I have value beyond my last name?’ she asks. As Rockefeller leads us on her life journey -- from early academic challenges, to finding her voice inside her family, to youthful environmental advocacy, to pioneering work in the field of emotional intelligence, to finding her husband and soul mate -- she finds her lights, and resolutely puts her singular gifts to work in making the world a better place. Her challenges are very specific; her quest for selfhood universal." “Being a Rockefeller, Becoming Myself is an extraordinary book about a most remarkable woman who transformed her life and the lives of those around her. Insightful and inspiring!”—Dean Ornish, M.D.